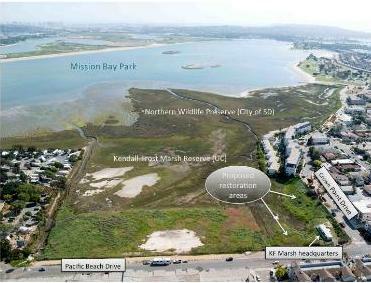 Aerial view of Kendall-Frost Marsh Reserve (owned by UC), Northern Wildlife Preserve (owned by the City of San Diego) and proposed transition zone restoration areas. The total project area is approximately 2 acres but the area that gets modified significantly is approximately 1 acre. Note the 2.5 acre rectangle in the foreground alongside Pacific Beach Drive (“Frost Property”) is owned by the City and still remains as construction fill and non-native plants. The actual marsh is between these areas and Mission Bay. When the tide is high seawater comes up to the edge of the Frost Property and the proposed restoration area. The tide also floods the storm water drains at the southern ends of Olney Street and Noyes Street. Compare this picture, taken on 6/12/15 when the tide was at a nominal 1 foot elevation, with the next one when the tide was at 6 feet on the same day. Presently the normal highest tides locally are around 7 feet, which covers the small ridge just beyond the silt fence. Present predictions are that sea level rise will add 3 feet by the end of this century though the uncertainty in that increase is quite large. Salt marshes have three sections in an elevation sense. Low marsh gets inundated with salt water frequently so only plants and animals that have evolved appropriately can survive. Upland is basically coastal land that has very little salt in the ground. The part in between low marsh and upland is the transition zone and is typically only about 10 feet high, so this means that plants change a lot in that vertical distance. In coastal CA there is very little natural upland as it has been converted into roads and buildings, and the transition zone has become a receptacle for construction fill in the last 100 years. As a result the soil is very poor quality and has been turned into a place where non-native weeds thrive, insects and native plants do not. 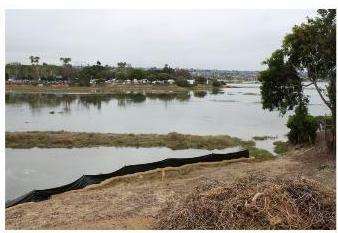 The 2 acre transition zone section of the Kendall-Frost Reserve beside the UCSD trailer is typical of the general situation noted above and the reserve ecologists have long wanted to improve the situation. In particular the specific area noted in the map is very uneven in its topography due to hillocks of fill close to the low marsh. As sea level rises in the future the salt-water plants will have trouble migrating up the slope as they will become trapped in local peaks (peaks here are only a few feet high!). 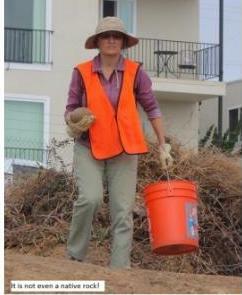 Gentle slopes are needed as plants don’t move up slope quickly! The general plan of the restoration is straightforward; smooth out the topography, remove the worst of the fill (concrete, asphalt), plant native plants and make the area more suitable for visitors. 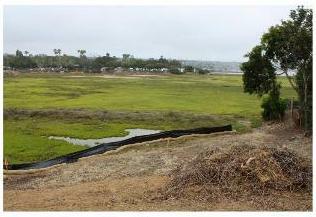 It took two to three years to get the detailed scope agreed, neighbors to accept it, Coastal Commission and Army Corps of Engineers approval, find sponsors to provide funding, get surveys done, and work out multiple details. Part of the difficulties and delays were caused by the need to do the work on a shoe-string budget. Total external funds granted are $40,000. This implies that most of the detailed management and actual work is done by people who have to do their normal work as well, plus volunteers who usually are not expert in the relevant technical topics. The fact that the actual grading has been largely accomplished speaks volumes for the dedication and hard work of the key people; Isabelle Kay the UC reserve manager, Larry Cozzens the assistant reserve manager, Carolyn Lieberman of the US Fish and Wildlife Service, Rebecca Schwartz of SD Audubon Society. 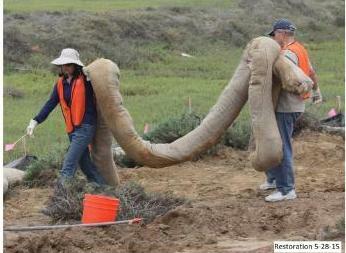 UCSD, USFWS, SD Audubon Society and the CA Wetlands Recovery Project generously provided the support. Carolyn and a volunteer, Chett Chew, moving a fiber roll just in case there is a flood of rain that would send mud into the marsh. Of course some people in California would be happy to see such rain. Isabelle is very keen to remove non-native material! 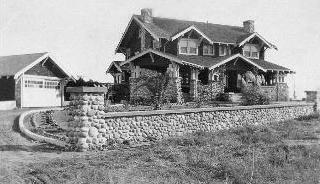 There are a large number of almost spherical rocks locally and we suspect they are the remnants of the walls of the Kendall house that used to occupy the space where the large condominium building now sits on Crown Point Drive adjacent to the west end of the restoration site.